The Stack’s Bowers and Ponterio bi-annual Hong Kong auctions are always highly anticipated and heavily attended. The firm’s most recent April 2-5, 2018, auction was no exception, featuring the "Q. David Bowers/R.B. 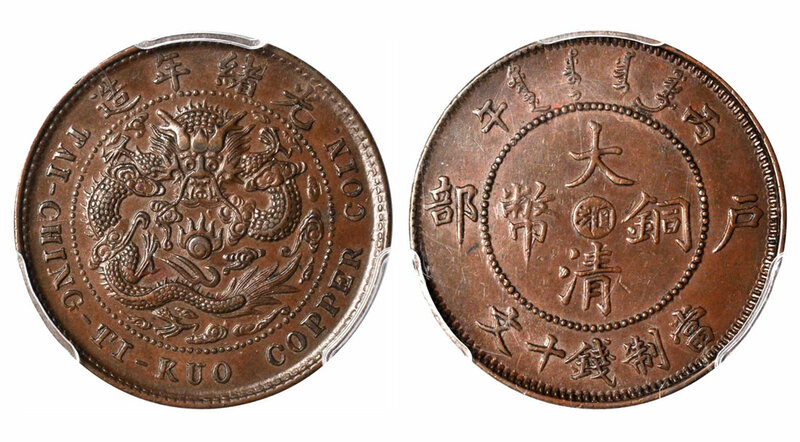 White" Collection of Chinese Copper Coins, as well as other major coin and currency rarities. In total, the Stack’s Bowers and Ponterio April 2018 Hong Kong auction realized in excess of $11 million. Session A featured the Q. David Bowers/R.B. White Collection of Chinese Copper Coins. 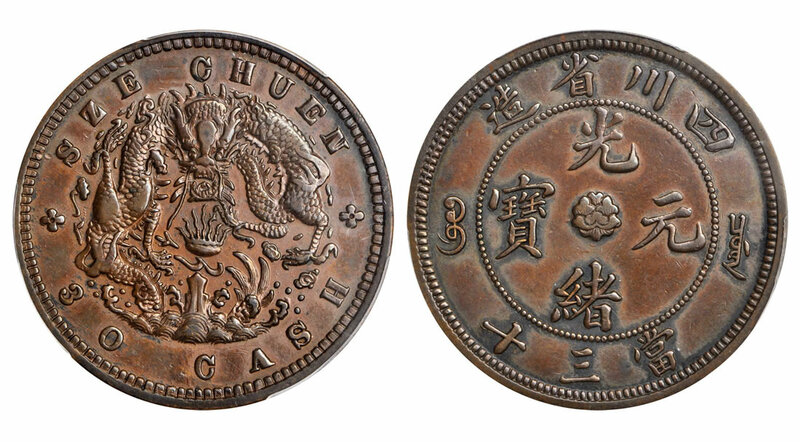 Highlights included lot 40067, the legendary An-Hui "Fang Kong" square hole Ten Cash, which realized $52,800. CHINA. Anhwei. Pattern 10 Cash, ND (1902-06). NGC MS-65 BN. This piece realized $52,800. 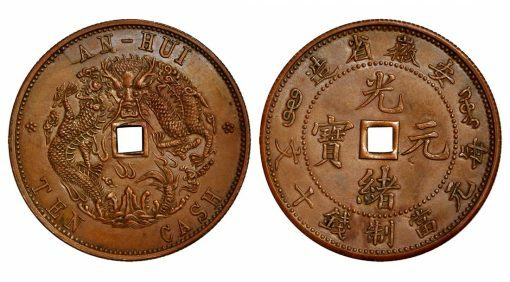 Lot 40068, the "An-Hui" Pattern Five Cash (spelled "EIVE") realized $40,800, an extremely rare "Flying" dragon Ten Cash from Anhwei in lot 40070 brought $84,000, and lot 40090, a copper-nickel pattern Ten Cash from Chekiang, sold for $60,000. The iconic Honan 500 Cash in lot 40137, one of the largest copper coins ever struck in China, realized $75,000. CHINA. Honan. Pattern 500 Cash, ND (ca. 1927-28). PCGS SP-62 BN Secure Holder. This rarity sold for $75,000 at Stack’s Bowers and Ponterio April 2018 Hong Kong sale. Two interesting and popular varieties from Hunan were offered in lots 40143 and 40144. The broom tail dragon Ten Cash in the first lot brought $57,600, while the fabulous style Ten Cash in the second sold for $48,000. CHINA. Hunan. 10 Cash, CD (1906). PCGS AU-58 BN Secure Holder. This rare coin sold for $57,600. Lot 40201, the only known Kiangsu-Chingkiang "Huai" pattern Twenty Cash in private hands realized an astonishing $504,000. 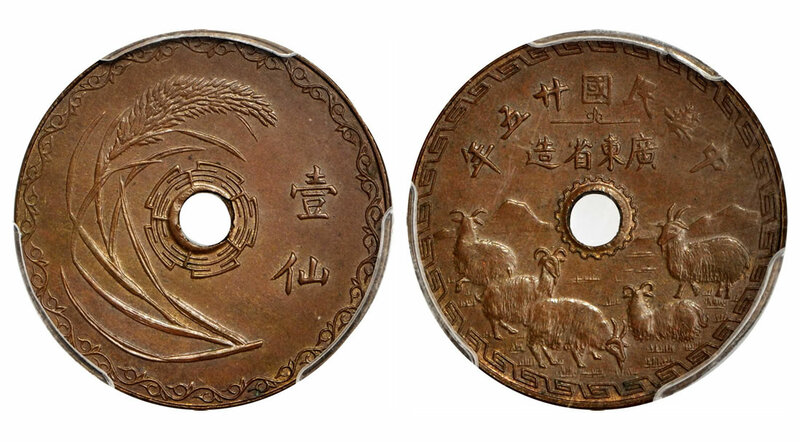 The Kwangtung "Five goats" pattern Cent of the celestial King of the South (lot 40216) realized $48,000. CHINA. Kwangtung. “Five Goats” Pattern Cent, Year 25 (1936). PCGS SP-64+ BN Secure Holder. This piece sold for $48,000. An extremely rare pattern Twenty Cash from Shantung (lot 40225) brought $84,000, while the legendary Szechuan pattern Thirty Cash (lot 40247) sold for $504,000. Lot 40299, an early Republican pattern signed by L. Giorgi the head of the Tientsin mint, realized $43,200. Lot 40301, also an outstanding quality pattern from the early Republican period displaying the effigy of Yuan Shih-kai sold for $288,000. CHINA. Pattern 10 Cash, ND (1913). PCGS SP-65 BN Secure Holder. This coin brought $288,000 at Stack’s Bowers and Ponterio April 2018 Hong Kong sale. 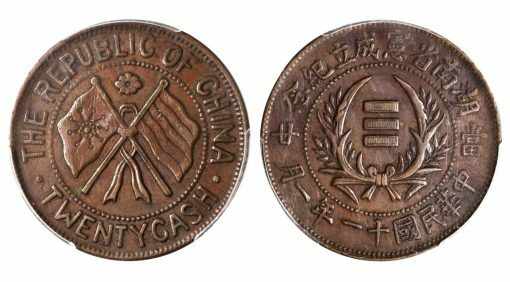 Strong prices continued through the remainder of the auction with the results for the Vintage Chinese coins in Session B proving to be as strong as ever. Lot 50052, a condition census 1898 Chekiang 3 Mace 6 Candareens realized $66,000. 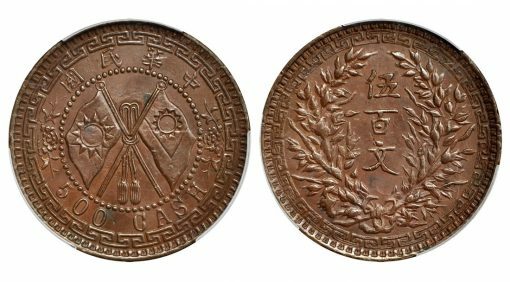 A lovely Mint State example of the first Dollar of the Pei Yang Arsenal dated 22nd year of Kuang Hsu in lot 50056 brought $180,000. Lot 50107, a Mint State "small characters" Hupeh Tael realized $60,000, and a high grade Kirin "Wu Shen" Dollar (lot 50161) sold for $144,000. CHINA. Chihli (Pei Yang Arsenal). Dollar, Year 22 (1896). NGC MS-62. This rarity realized $180,000. 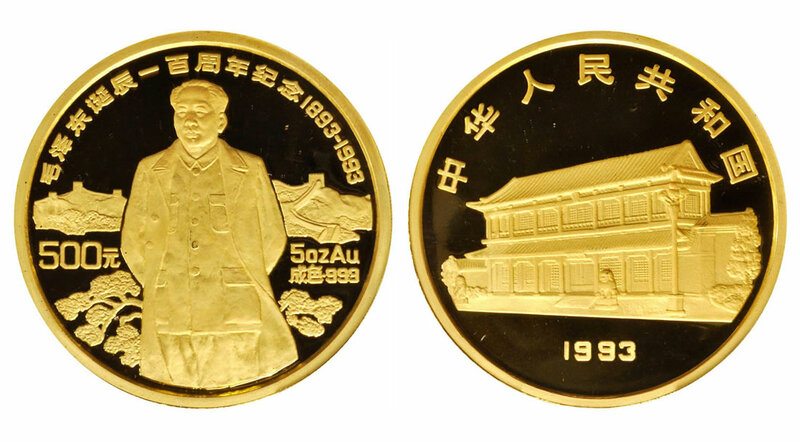 Lot 50181 presented the always popular Kweichow "Auto" Dollar depicting warlord Zhou Xicheng’s car where he was gunned down by his opponents, a coin that realized $50,400. Lot 50302, the finest certified pattern 5 Mace CD (1906) realized $66,000. An icon of Chinese numismatics, a wonderful long whisker pattern dollar in lot 50307, sold for $180,000. Lot 50308, an interesting reverse pattern Dollar in near Gem condition, was bid to $156,000. CHINA. Long Whisker Dragon Pattern Dollar, Year 3 (1911). Tientsin Mint. NGC MS-63+. This coin also sold for $180,000. The offerings of modern Chinese coins saw healthy results in Session C with lot 51083, a massive gold kilo Panda realizing $72,000. Among the lunar coinage, lot 51123, a magnificent 12 ounce gold rooster brought $84,000. Other modern series saw similar results, as shown by lot 51188, a superb gem centenary of Chairman Mao’s birth, that sold for $138,000. CHINA. 500 Yuan, 1993. NGC PROOF-69 ULTRA CAMEO. This rarity sold for $138,000 at Stack’s Bowers and Ponterio April 2018 Hong Kong sale. 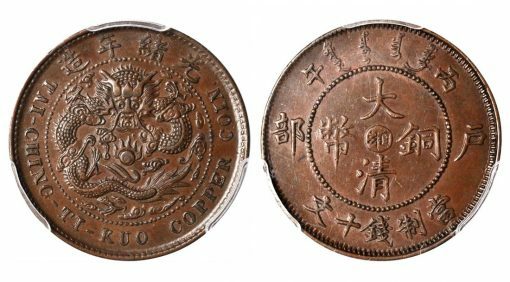 Session D presented a larger selection of world coins than previous Stack’s Bowers and Ponterio Hong Kong auctions and brought surprising results. 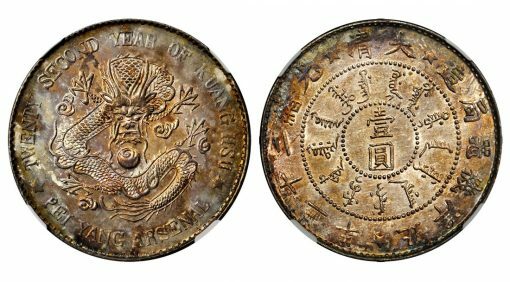 A collection of Burmese coins was highlighted by lot 52096, an extremely rare Kyat dated CS 1222 (1860) that realized $36,000. 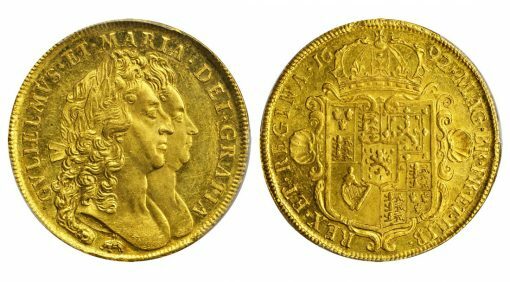 A nice selection of British gold was highlighted by a trio of Triple Unites: lot 52143 sold for $108,000, lot 52144 realized $96,000 and lot 52145 brought $108,000. A Mint State William and Mary 5 Guineas in lot 52146 realized $204,000. GREAT BRITAIN. 5 Guineas, 1692. William & Mary (1689-94). PCGS MS-62 Secure Holder. This piece sold for $204,000. 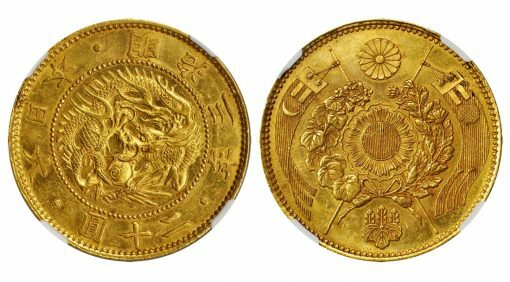 A small, but robust section of Japanese coins was highlighted by two 1870 20 Yens, with lot 52186 realizing $63,000 and lot 52187 realizing $40,800. A varied gathering of Thai coins was highlighted by a very rare 1951 1,000 Baht which sold for $66,000. JAPAN. 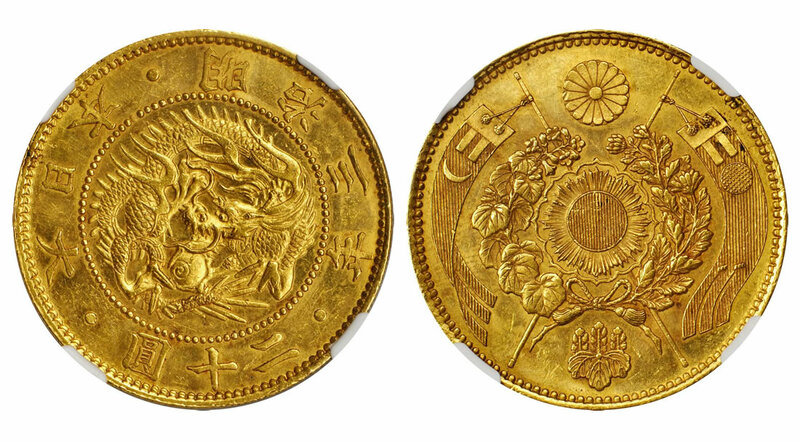 20 Yen, Year 3 (1870). NGC MS-62. This coin sold for $63,000. The results garnered by the paper currency in Session E reflected continued strong bidder participation. Lot 60025, a Hong Kong 1941 50 Dollars Mercantile Bank of India Limited realized $12,600. A Japanese occupation of Russia during World War II 10 Kopeks in lot 60070 sold for $12,000. 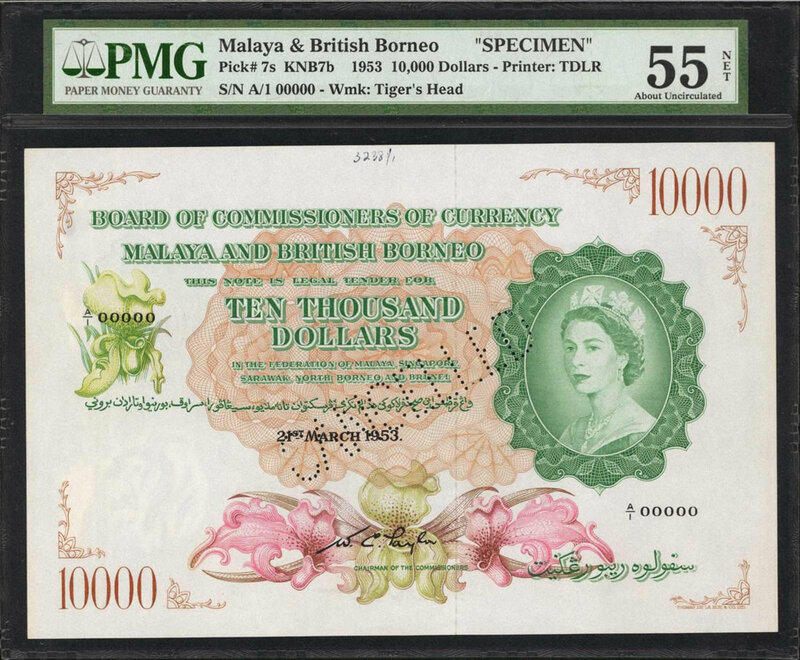 The British administration of Malaya 1942 1,000 Dollars in lot 60102 realized $15,000, while lot 60107, a Malaya and British North Borneo 10,000 Dollars Specimen, brought $36,000. A beautiful high denomination Singapore 10,000 Dollars presented in lot 60162 realized $24,000. 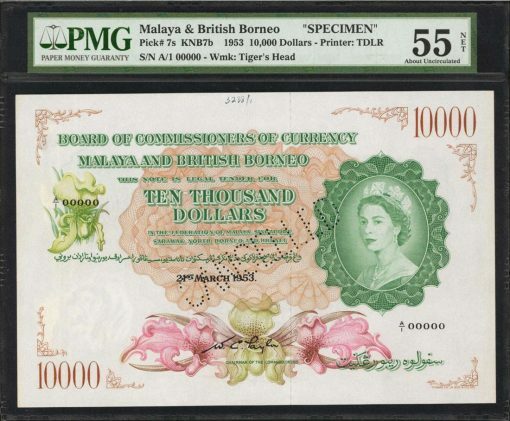 Malaya and British North Borneo 10,000 Dollars Specimen. 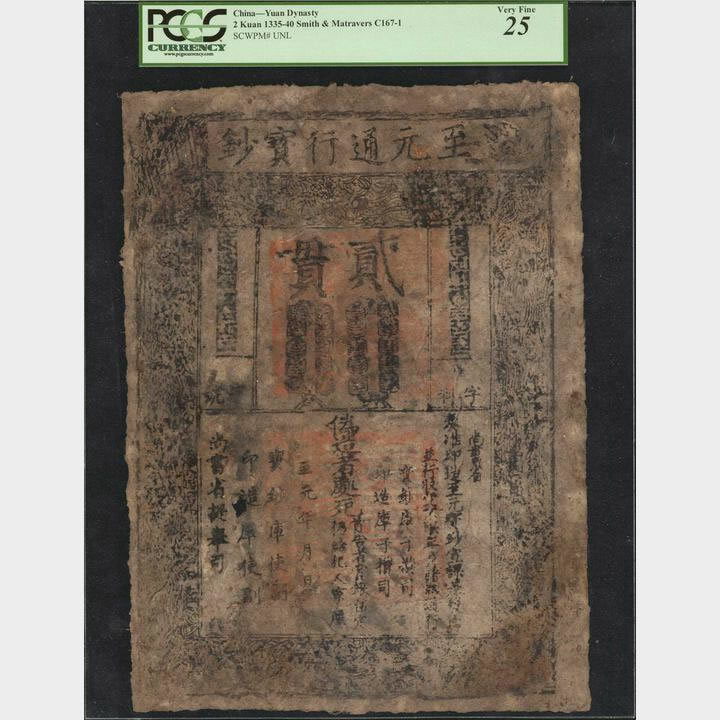 This note sold for $36,000 at Stack’s Bowers and Ponterio April 2018 Hong Kong sale. 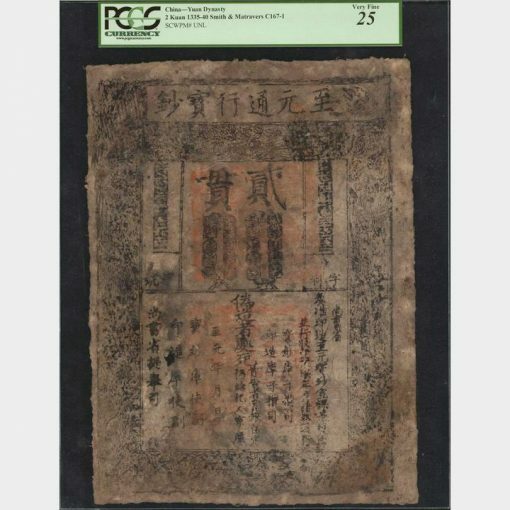 The Chinese paper money, one of the most heavily written about areas of Chinese numismatics, also saw much activity as lot 60226, an incredible Yuan Dynasty 2 Kuan, realized $43,200. The 1913 Fungtien 5 Dollars from the Bank of Communications offered in lot 60273 brought $13,200 and a popular Peoples Republic of China 1953 10 Yuan in lot 60359 realized $33,600. 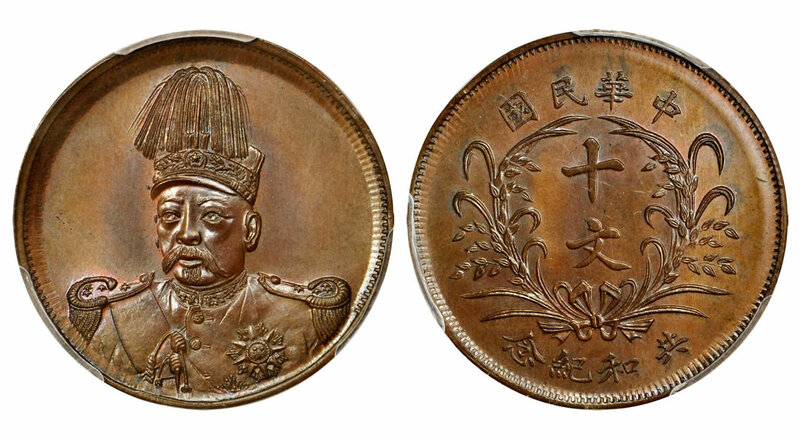 Strong bidding persisted well into the Foreign banks of China with lot 60421, a 1902 Banque de L’Indo-Chine Dollar Specimen, selling for $24,000. CHINA–EMPIRE. Yuan Dynasty. 2 Kuan, 1335-40. P-UNL. PCGS Very Fine 25. This note brought $43,200. The auction was far from over with the completion of the floor sessions. The Internet-only sessions F, G and H also saw spirited bidding and impressive results. In session F, the Internet offerings from the Q. David Bowers/R.B. White Collection, a brass Fengtien Ten Cash in lot 41019 realized $2,280 and a rare small English letters Honan Ten Cash in lot 41023 brought $2,400. Lot 41027, a crossed flags Hunan Twenty Cash, sold for a surprising $7,200. 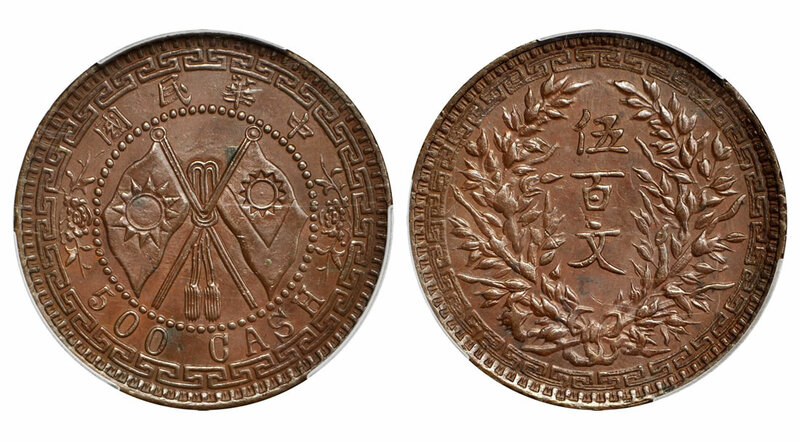 The vintage Chinese and foreign coins in session G featured a large selection of mint errors. Two full obverse brockages (lots 53075 and 53076) each realized $2,400. 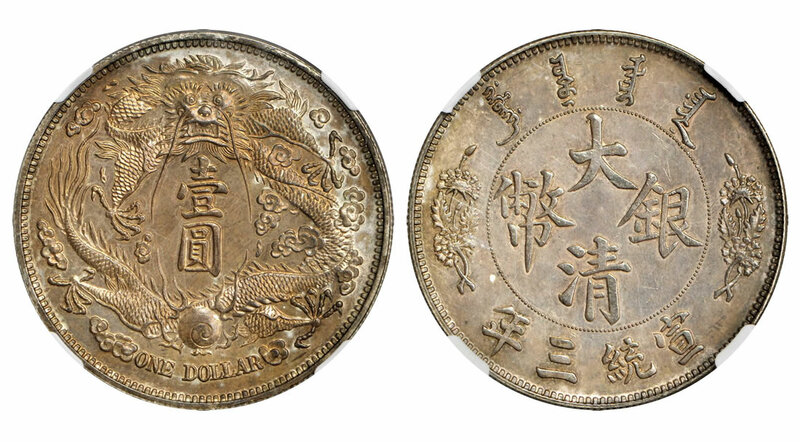 A nice wholesome silver Dollar from Kiangnan in lot 53102 brought $2,160. CHINA. Hunan. 20 Cash, Year 11 (1922). PCGS EF-45 Secure Holder. This coin brought $7,200. Lot 53650 presented a double struck 1976 Hong Kong 5 Dollars with the second strike 85% off center and was bid to $2,880. An unlisted date Indian Rupee from Hyderabad realized $3,120. Session H concluded the auction with a wide array of banknotes from various locations, highlighted a 1935 Straits Settlements 5 Dollars (lot 61144) that brought $1,320, a late Qing dynasty Ta-Ching government bank 1906 Dollar (lot 61195) that realized $2,280, and a 1941 Communist bank Shaan Gan Ning Bianky Inxang 5 Yuan (lot 61308) that sold for $1,800. The prices realized over the four-day auction of over 3,300 lots show strength in the market and the appeal of an auction that offered a great variety of items to many happy participants. Stack’s Bowers (stacksbowers.com) is currently accepting world coin and paper money consignments for their August ANA World’s Fair of Money, Collector’s Choice Online and August Hong Kong sales. Consignment specialists can be reached at 949-253-0916 or via email at info@StacksBowers.com. I only have one thing to say about the business value and pocket change. Clearly coins found to be worth above face value are found in pocket change. Obviously pocket change is generally not shiny. Having said that you have a worth on where they came from to start. Coins that are rare, 1968 no s is rare. Correct? Anything that are few in circulation should have a higher value period.. A mistake was made according to you in one of two places which in that of itself makes the value higher and you know it. Should’t 1 of *my 2 be modern by now! I*ll let it be, *your choice. when so many don’t get it, there future is bleak! *I get it, know matter which way you twist it. It all boils down to *1 simply thing!